The Artificial Reef Program, Coastal Fisheries Division, Texas Parks and Wildlife Department, has been awarded a grant through the Coastal Management Program. Cycle 21 – Construction and Enhancement of Artificial Reefs in the Western Gulf of Mexico In September 2015, the Artificial Reef Program submitted a request for grant funding to the Texas General Land Office under the Coastal Management Program – Cycle 21. The proposal was to create low-relief and mid-relief patches of structures at the Rio Grande Valley Nearshore Reef Site. These structure patches would consist of pyramids and concrete blocks placed strategically within the deployment region. Texas Parks and Wildlife Department received notification in February 2016 and signed a working contract with the Texas General Land Office in December 2016. Federal monies could be passed through to the Texas General Land Office and released for our use by October 2017. The TPWD request for Bids for the construction and deployment of the reef materials was closed in July 2017. Deployment is expected to begin in early 2018. 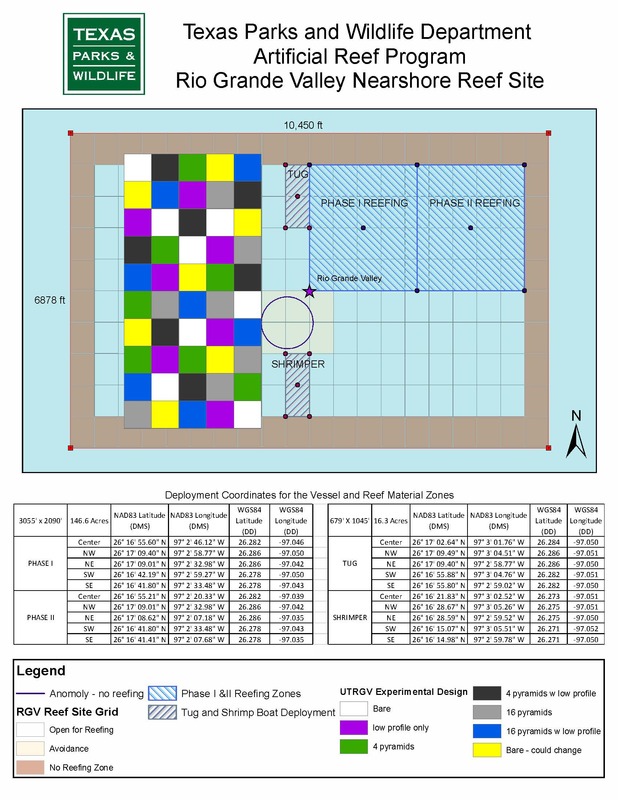 Cycle 22 - Construction and Enhancement of Artificial Reefs in the Northeastern Gulf of Mexico. In September 2016, the Artificial Reef Program submitted a request for grant funding to the Texas General Land Office under the Coastal Management Program – Cycle 22. 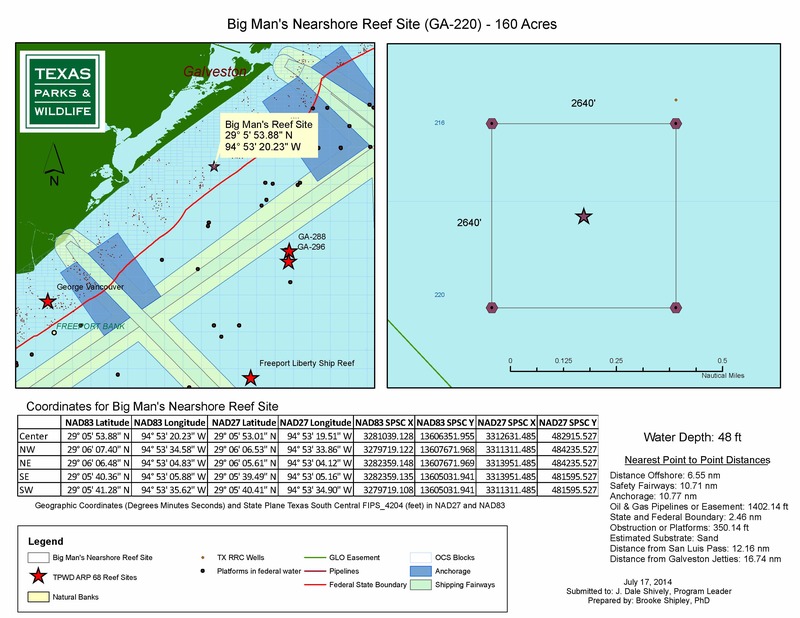 The proposal was to create low-relief and mid-relief patches of structures at the Big Man’s Nearshore Reef Site. These structure patches would consist of pyramids and concrete blocks or rubble placed strategically within the deployment region. We received notification of the acceptance of the grant proposal in January 2017. Deployment is expected to begin in late 2019. Construction of this material was made possible by a grant under the Coastal Zone Management Act of 1972, as amended, and awarded by the Office of Ocean and Coastal Resource Management, National Oceanic and Atmospheric Administration, U.S. Department of Commerce, and approved by the Texas Land Commissioner and the Texas Coastal Management Program. this project is funded by a Texas Coastal Management Program grant approved by the Texas Land Commissioner pursuant to National Oceanic and Atmospheric Administration Award No. NA16nos4190174 and NA17nos4190139. More than 140 petroleum platforms—with more on the way—have found new purpose as marine habitat in the Texas Artificial Reef Program. Texas boasts 66 artificial reef sites ranging from 5 to 100 miles from shore in the Gulf of Mexico—that’s 3,440 acres of prime fishing and diving adventure. Seven reef sites within nine nautical miles of shore serve as accessible nearshore fishing and diving opportunities. Red snapper, the most popular game fish in Texas Gulf waters, thrive around artificial reef sites. Scientific divers see red snapper at TPWD artificial reef sites during four of every ten visits to these locations. With a few exceptions, the floor of the Gulf of Mexico is flat and bare except for artificial reef sites. Nearly 200 marine fish species have been seen on these complex, stable, and durable habitats among artificial reef structures. Sixteen of 23 U.S. coastal states (or 70 percent) maintain artificial reef programs. The Texas Clipper ship reef off South Padre Island generates more than $1 million for the local economy from anglers and $1.4–$2 million from divers. Anglers spend on average $460 per fishing trip, while divers spend upwards of $2,000 per dive. Thirteen ships have been intentionally sunk as part of the Texas Artificial Reef Program, the largest being the USTS Texas Clipper. She’s 473 feet long—that’s 1.5 times the length of a football field.